- With its aluminum alloy construction and multi-coated glass, this lens provides sharp, clear images. - The rotatable tripod mount is positioned to provide optimum balance and rotates for quick and easy vertical format shooting. - Given it amazing power, this affordable 500mm telephoto lens is perfect for nature, sports shooting.When combined with the included T-mount to fit your camera, this super telephoto works on both "full frame" cameras as well as the "APS-C" style digital SLR cameras. - You can use the lens in "M" manual exposure mode or "A" aperture-priority mode only. - Its enhanced optical design consists of 4 lens elements in 4 groups with minimal glass-to-air surfaces. - The physical design also incorporates a tripod mount and removable lens hood that helps to minimize lens flare and ghosting. With its aluminum alloy construction and multi-coated glass, this lens provides sharp, clear images. The rotatable tripod mount is positioned to provide optimum balance and rotates for quick and easy vertical format shooting. 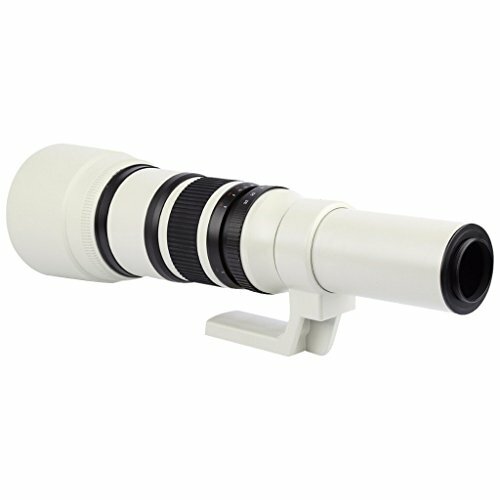 Given it amazing power, this affordable 500mm telephoto lens is perfect for nature, sports shooting.When combined with the included T-mount to fit your camera, this super telephoto works on both "full frame" cameras as well as the "APS-C" style digital SLR cameras. You can use the lens in "M" manual exposure mode or "A" aperture-priority mode only. This lens' sophisticated achromatic refractor design yields images with pleasing peak contrast and well controlled flare. If you have any questions about this product by Jili Online, contact us by completing and submitting the form below. If you are looking for a specif part number, please include it with your message.